You’re sitting looking at your half-eaten sandwich in disbelief. Your jaw feels like you just completed one of those eating challenges on TV. The kind that features a burger with 20 patties and enough fries to feed a family of 4. Yours is just a simple sandwich and some apple slices, but you can feel your jaw throbbing nonetheless. You might be suffering from TMJ pain, or pain in the jaw joints. The question now is what can you do about it? Dr. Makram wants you know about your options for TMJ therapy in Naples. Wait, What Does TMJ Stand For? These are all signs of TMJ pain, or a TMD (temporomandibular disorder). They usually stem from an unconscious clenching of the jaw. Some typical causes for TMJ pain are stress, injury to the area, arthritis, or nighttime teeth grinding (also known as bruxism). TMJ pain can be chronic and have a great effect on a person’s day to day life, so it should be treated as soon as possible. 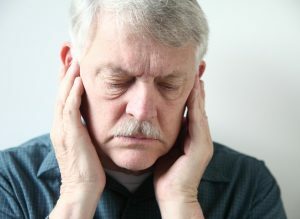 If you are suffering from TMJ pain, there are a few viable options for treatment. The first is to try and reduce the amount of stress in your life. This can be difficult because stress can be related to unchanging factors such as work and family. Dr. Makram may suggest a series of stress-relief exercises to help relax the muscles in your face. If the pain comes from unconscious clenching during the night, as it often does, he may prescribe that you use an oral appliance. This would be a customized mouth guard that you would wear every night to bed. It would serve the dual purpose of shifting your jaw into a more comfortable position so the joints can heal, as well as prevent you from grinding your teeth. Each oral appliance is custom fitted for every patient using flexible and durable materials. This ensures that they are comfortable, and that it will be easy for the patient to consistently use. Want to know more about what you can do for your TMJ in Naples? Be sure to call us right away as we’re more than happy to answer any of your questions. We know we can help you figure out a lasting solution for your pain.